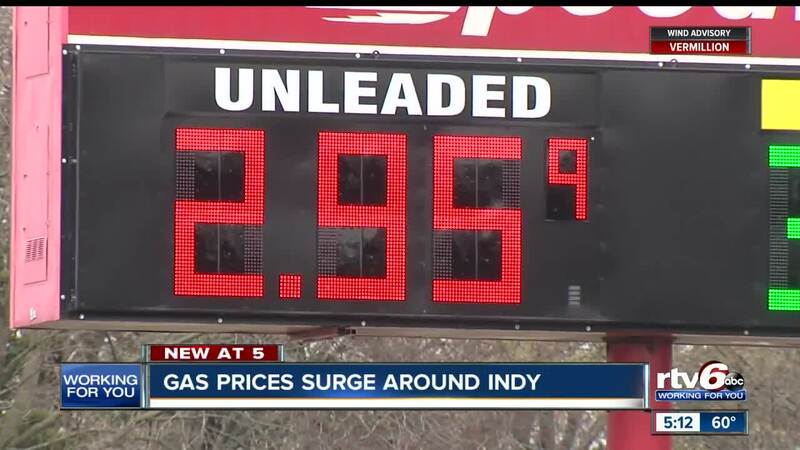 INDIANAPOLIS — A visit to the gas station got a lot more costly Wednesday afternoon after prices around Indianapolis surged more than 30 cents from the morning. Gas Buddy said the average price in the area is now $2.95 a gallon. As of 8 p.m., though, you can still fill your tank for $2.65 a gallon at the BP location at 2427 W. Washington St. and $2.67 a gallon at the Marathon at 430 N. Alabama St. The national average according to Gas Buddy is around $2.75 a gallon. Indiana has the 12th-highest average at $2.84, while California will set you back the most at $3.90 a gallon. Arkansas and Alabama are the cheapest at $2.47.